Let’s talk about toothpicks. I can’t imagine eating corn on the cob without knowing there’s a toothpick nearby, and they often come in handy after steak, too. Turns out those little wooden sticks are good for more than just picking out the food that gets stuck in your teeth. Which is good because I’m pretty sure toothpicks are a household staple, and an inexpensive one at that. Is there anything more frustrating than losing the end of a roll of tape?!? Never let that happen again by attaching a toothpick to the end of the tape. It won’t stick to itself and you’ll be able to pick it up when you need it. Dip a toothpick in alcohol and use it to get into the small areas of your phone or keyboard. Once you pipe that icing on the cake there’s no going back- a thought that always fills me with anxiety. Make it easier on yourself by lightly sketching out your design and then filling it in with the icing. Genius! Have a small hole in your garden hose? 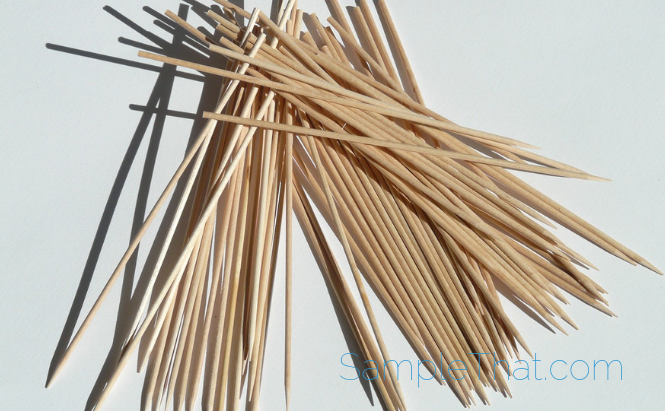 Break off about a third of a toothpick and stick it into the hole. When it gets wet, the wood will expand and plug up the hole. I’m pretty sure everyone already does this, but you never know, and it’s a good one, too. Use a toothpick to check if a cake is done. Stick it into the middle of the cake; if it’s done, the toothpick will be dry, if it’s wet, bake a little longer and keep checking. There are so many craft projects you can do using toothpicks. Here are a few to get you started.